St. George. A fascinating blend of Australian and Early European settlement history. A unique slice of Australian life that takes in the cuisine and culture of the world, truly a worldly location. All this and more on your door step so what’s holding you back? 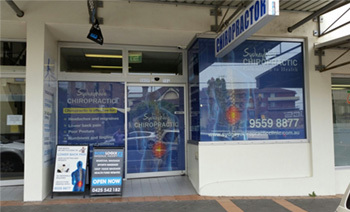 If the answer is back or neck pain and discomfort then you need Sydney Wide Chiropractic who have the answers you have been looking for. We have a staff of highly trained and experienced who are committed to helping you when it comes to your unique situation, whether that is back or neck pain stemming from nerve or spinal imbalances to more long term issues like sports injuries, RSI or chronic pains, we have the solutions for you with specialized and personalized treatment modules suited to your needs. As the premium chiropractor in St. George we understand better than anyone that your body is capable of self-healing and self-regulating and it is our goal to rectify the imbalances caused by a stressful and fast paced life and put you in control of your own wellness with education and rehabilitation programs that don’t trap you in ongoing cycles of expensive chiropractic care, but utilize our affordable checkup system to match our ongoing care of you with your own personal healthcare vision. Your chiropractor in St. George can help renew your well-being through harmonized and proven treatment programs specifically tailored to your body, we don’t operate with a generic approach that simply treats the symptoms, and we get to the root of your bodies requirements to prevent any ongoing causes of pain and discomfort. Ultimately, your health starts with you, but it truly excels with us. You deserve a chiropractor who puts your needs first and whose aim is simply to educate and rehabilitate to the point where you can’t imagine how you got by without us, because we’re only successful when you are. So if you’re ready to live life happier and healthier then give us a call today on (02) 9529 4008 or email us at info@sydneychiropracticclinic.com.au and organise your first treatment now.